I dont seem to loose pressure, but its been like this for a few days now.. after I ride I cant see squat, but if I leave it to charge or just in a stationary position, these "wet" spots comes up. Yeah, I think its fairly normal. My tire has a ton of small punctures that leak ooze, but it doesn't seem to lose any pressure. The slime is doing its job. @BadWolf I was going to post the same question! I have tons of those little oozing holes [insert joke here]. I'm also not losing tire pressure, but it was kinda freaking me out. Glad to hear others are having the same issue with no serious problems arising from it. 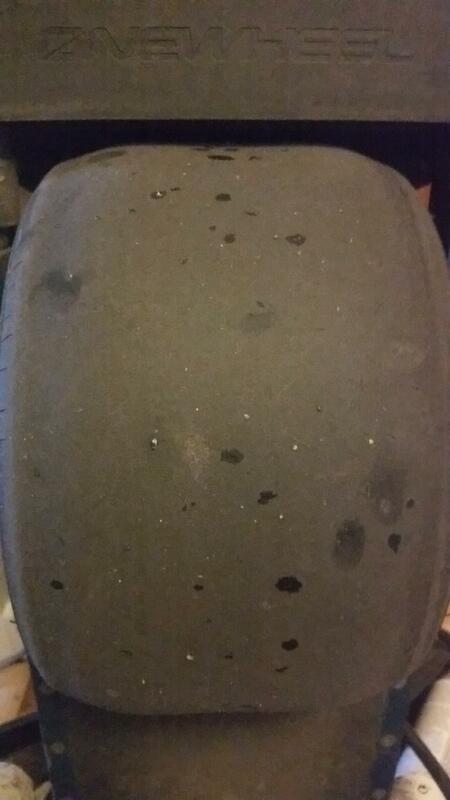 Guess that pre-slimed tire really works! @BadWolf So this was my tire this morning. Pretty leaky for standing dry all night (and riding in dry weather yesterday). The small holes are completely normal. The tire is a go-cart tire, and is designed to absorb all kinds of things without puncturing the tire. So it picks up pebbles, glass fragments, etc and they embed in the gooey outer rubber layer of the tire- it's what it's meant to do. Every now and then I take a wire brush and pick out the road debris, just to keep them from digging in deep into the tire. @groovyruvy So is that liquidy stuff just the rubber itself? @groovyruvy Thanks for the info. I didn't post any photos, that was @BadWolf. And as both of us mentioned, neither of us are losing any pressure. I've been checking mine for a few weeks. I was just curious if the oozing was the slime (as you mentioned, Future Motion claims they pre-slime every tire, so no one should actually need to do it themselves) or the rubber itself. @thegreck got it. From my experience it's just water leaking out of the holes, I've not had any slime leaking out (or if it is I'm ignorant).